We share with you a memorial to one of our fallen heroes, especially that his family and friends might know that he is remembered with love. Many criminals and insurgents captured or killed, and important humanitarian work carried on by the Iraqi Army. BAGHDAD – A tip led MND-Center Soldiers to a cache containing an anti-aircraft gun and over a hundred 37 mm rounds, April 27 in the al-Hujierr area of Jurf as Sakhr, 40 km south of Baghdad. Soldiers from 7th Inf Regt, 4th BCT, 3rd IS, used intel gathered from SoI to locate the cache. At the site the unit was assisted by a local resident who had an excavator to help them dig. After digging approx. 10 feet, the anti-aircraft gun and crate of munitions were visible. “We couldn’t have done this without the hard work of the Soldiers who dug up the cache all day and the SoI who reported it,” said 1st Lt. Ryan Daly, Co A. The anti-aircraft gun is considered to be in operable condition and is believed to have been buried approx. 4 to 6 months according to informants. 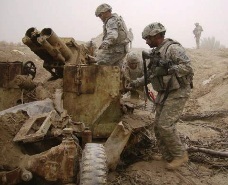 Soldiers from 2nd Plt., Co. A find an anti-aircraft gun. TIKRIT – A successful Iraqi-led humanitarian operation was held in the town of Jadidah, Mosul Province, April 29. The op, a gathering between IA leadership, the Jadidah sheik and informal leaders, was held to counter AQI’s info ops, defaming Iraqi and CF. Over 200 children and over 130 adults received humanitarian assistance in the form of dry foods, water, vitamins, clothes, comfort items, toys and athletic gear. This successful op set the conditions for reconciliation, support and future cooperation. BAGHDAD – CF killed 4 criminals and destroyed their heavy weapons in 2 separate engagements, April 29. At approx. 5:15 p.m., criminals were observed firing a mortar system in north east Baghdad. A fixed wing aircraft proceeded to drop a bomb, killing the 2 criminals and destroying their weapons system. At approx. 5:30 p.m., Soldiers from the 4th bn, 64th AR came under attack by heavy machine gun fire from a house in north east Baghdad, and returned fire killing the 2 criminals and destroying 2 illegal machine guns. CAMP VICTORY – An Iraqi citizen led Iraqi Soldiers to a cache containing 450 57 mm mortar rounds, approx. 50 kilometers southwest of Baghdad, April 28. The rounds were deemed unserviceable, but could still be used as IEDs. The cache was buried in a field in the village of Abu Osage. BAGHDAD – Multi-National Division – Baghdad soldiers engaged and killed a criminal and wounded another after receiving small-arms fire during a security patrol at approx. 1 a.m., April 29 in the Rashid district of southern Baghdad. Soldiers from 1st BCT, 4th ID responded to the ambush led by 2 men in Abu T’shir, where the squads conduct ops daily. 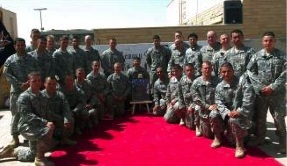 PB HOWELL, RIYAD – The 1st Bn, 87th Inf Regt named their new Patrol Base after Pfc. 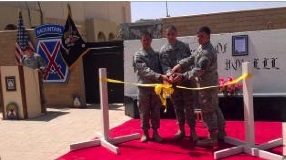 George Howell during a ribbon cutting ceremony in Riyad, located in the Hawijah district of northeastern, Iraq, April 26. Howell, 24, was an Infantryman with 2nd Plt, Delta Co, 1-87, 1st BCT, 10th Mtn Div. He was killed by an IED while on patrol during combat ops Dec. 21, 2007. Pfc. Lewis Nagel summed up the unanimous response of the platoon when asked what memory of Howell will remain with them. “His disposition. I never saw Howell without a smile on his face. He was one of the nicest guys I’ve ever met,” Nagel said. Howell is survived by his pregnant wife, Kristen, and two children; Raiden and Niya. 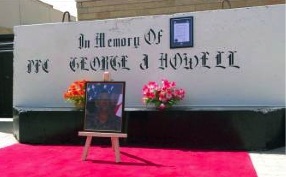 A barrier at PB Howell in Riyad stands in honor of its namesake, Pfc. George Howell, revealed during a dedication ceremony. Capt. Jon Anderson, cmdr., Delta Co, salutes with other members of 1-10th Mtn Div during the playing of the National Anthem. First Bn, 87th Inf Regt Cmdr Lt. Col. Christopher Vanek, Pvt. Eric Wooten (representing the youngest member in the company), and Capt. Jon Anderson cut the ribbon. 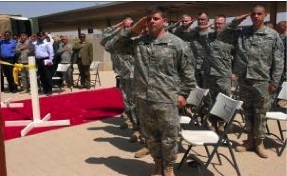 Soldiers with 2nd Plt, Delta Co, honored Pfc. George Howell during the dedication ceremony. FOB FALCON – Soldiers attached to the 1st BCT, 4th ID, discovered a cache at approx. 3:45 p.m. in the Abu T’shir community of southern Baghdad, April 28. Soldiers from Co F, 2nd Sqdrn, 2nd Stryker Cav Regt, with the assistance of the Iraqi NP, found 2 IEDs consisting of 20 pounds of TNT and 24 pounds of homemade explosives. Soldiers also found 3 155 mm artillery rounds, 6 120 mm mortar rounds, 34 82mm mortar rounds, a 60mm mortar round, 3 RPGs, and approx. 1,000 rounds of ammo. The soldiers of “Fox” Co also found 3 81 mm mortar rounds during security patrols, April 29.